Hey, Bill Joyce: Nice Job! 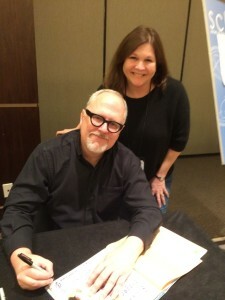 Me with Bill Joyce, getting a few of my favorite books signed. “I highly recommend winning an Oscar… it’s just really fun,” joked Bill Joyce. I’ve repeated his words to many friends after hearing Joyce speak at the 2016 Society of Children’s Book Writers and Illustrators conference in February. A crowd of 1,151 attendees devoured every detail of his speech, titled “Books are Like the Ice Cream Sandwich: How New Technology Doesn’t Change Much of Anything but it’s all Kinda Cool.” We laughed along with him as he described his whimsical approach to publishing, producing, writing, illustrating, and all the other projects his team develops at Moonbot Studios. Joyce described what it was like when he and Brandon Oldenburg won “Best Animated Short Film” at the 84th Academy Awards (Feb. 2012) for The Fantastic Flying Books of Mr. Morris Lessmore. From wearing tuxedos made by Dickies (that was an amusing tale) to hearing the phrase “nice job” from the likes of George Clooney and Meryl Streep, all in all, Joyce insisted that winning an Oscar “was just really fun.” Before that Oscar win, the film had also won numerous film festivals, including “Best Animated Short” at the Austin Film Festival, Cinequest Film Festival, and Cleveland International Film Festival (to name a few). Joyce wrote his winning story on a flight to visit his friend, Bill Morris, a “crusty old guy” who was ill. Morris was a longtime children’s books publisher at HarperCollins and Joyce’s mentor. Joyce read that early draft of the story to Morris, the muse for his book about Morris Lessmore (a play on words that referenced Morris’ diminutive size). The man who Joyce fondly refers to as “a three-martini lunch kind of guy” died two days later. Although Morris never saw Joyce’s team create the award-winning book, or the award-winning app, or the award-winning movie, he lives on in that inspiration. The Fantastic Flying Books of Mr. Morris Lessmore is a story of people who devote their lives to books and books that return the favor; it’s a poignant, humorous allegory about the curative powers of story. You can hear Bill Joyce talk about Morris here. Just like Morris’s smallness was good, so, too, is the smallness of Shreveport, Louisiana. Joyce hails from the same hometown as I, and while he has stayed there throughout his life, I moved from Shreveport to Houston about 20 years ago. (Fun Fact: We graduated from the same C.E. Byrd High School and were taught by the same journalism teacher, Mrs. Maredia Bowdon). I agree with his love of Shreveport when he says, “small is good.” Sometimes the anonymity I feel in Houston is comforting, but I often long for the ability to walk into a restaurant or store, knowing I will see someone I know. Shreveport reminds me of a rendition of the theme song from the 1980s television sitcom, Cheers, “Where everybody knows your name.” I miss that. While I left Shreveport to marry my love (aka/hubby, Kevin), Joyce stayed and became a cherished jewel in a small city that knows how to love their gems. He helped put our town on the map—a place now known for its stronghold in the film industry, primarily due to the tax incentives Louisiana offers producers and production companies. When he comes up with ideas, Joyce explained that he always thinks of the book first. I agree with his reference to books as being “the most artful and interactive way to tell a story.” Producers or investors sometimes push for the interactive nature of apps, but Joyce said he feels almost incredulous, saying, “What the hell do you think happens when you open a book?” And books even work better, he said: “They don’t break, they’re portable, and you can even drop them in water without creating too much damage.” So he thinks of the book first, usually (well, always). In the case of Morris Lessmore, the tablet (iPad) had just come out. Joyce’s team knew if they could be the first to release a beautiful story app, they’d get noticed. They also took full advantage of the lack of a gutter that the app offered (that large split between two pages that all illustrators hate!). So, they put the app out, and one famous guy tweeted about the app, and Moonbot received four million hits in three hours, thus dragging Joyce away from his swimming pool and back to the office. [He never told us at that SCBWI conference who the famous guy was, but apparently he had something to do with Facebook!]. Moonbot’s app became the #1 selling app in the world. That app was the same basic story as the book, but emphasized in a different way. Same thing with the movie—it was the same story, but silent (all visual, no words). So, the book was about to come out, the app went to #1, and the film won an Oscar (Remember the tuxedos by Dickies!). “The app paid for the short film because it did so well,” Joyce explained.